Explore the southern coast of the island, the unique traditions and customs of the Sasak - the native inhabitants of the island. Women making pottery, hand weaving, and get yourself dressed up like king & queen in traditional sasak customs, visit to the oldest village in central Lombok, lunch at Kuta Lombok, enjoy spectacular views of Lombok's best beaches. Your first stop will be at Banyumulek Village, one of many pottery village where clay pots for daily use, unique in style and high in quality is by hand made. Then on to Sukerare Village, where you see a tradition of weaving in well cared. 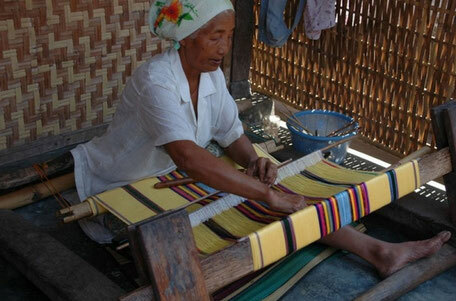 They weave gold and silver thread to be traditional Songket and Ikat cloth with very simple looms. Rambitan/Sade, a traditional sasak village located on the hill, 8 km from Kuta beach of lombok. This village shows you the unique way of life of the "Sasaks" the native inhabitants of Lombok. Kuta Beach / Tanjung Aan, both are situated on southern coast of Lombok, just 5 kilometers apart. these white sandy beaches with clear turquoise water are perfect for swimming and sun bathing.